I recently had the honor of being interviewed by City Kin, take a look. Hope you enjoy the read. You don’t need to stop living your life, you can simply include your little one(s) in just about everything. There are so many resources, activities and just about everywhere is family-friendly. 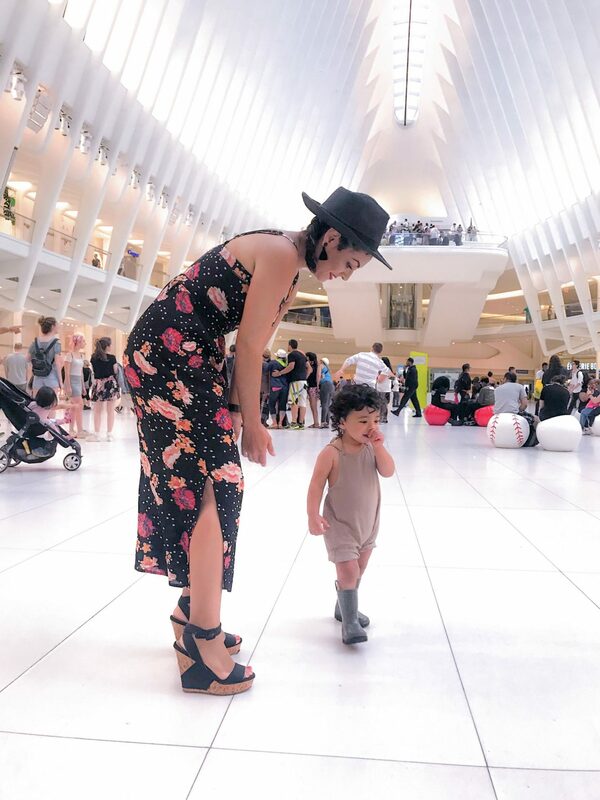 NYC has always given me so much life and now being a mother, that drive to still fulfill my goals and dreams while providing and being present in my son’s life is that much more of a priority. I love that NYC provides me the opportunity to have a career/ be an entrepreneur and still either be home with my son or get home to my little family in 30 minutes or so. I love how NYC exposes my son to endless experiences and opportunities; everything and every one. I love that you literally can walk everywhere. (This definitely benefited me while pregnant, and after). NYC is a walking city and this as well includes the littles. Of course they get plenty of stroller miles, but they need to be ready to walk as a main mode of transportation at a pretty young age. Its pretty easy to get 5-9 miles in on any given day. The vast food variety. Being that both my boyfriend and I consider ourselves experienced foodies, (HAHA) we love that there is such a wide variety of food options throughout the city for the little one to indulge in and develop a diverse food palette. The parks, parks, parks! One of the amazing things about NYC is their endless amount of amazing parks. During summer, the water pads within the parks. They are one of his absolute favorites. Summer concerts. The little has LOVED music since he was in my belly and any chance to listen to some jams and get his grove on is sincerely enjoyed. City Carousels. He truly enjoys a spin around with his favorite pony. I love watching him get so excited. Ahh, to be a kid again. Commuting through the city on MTA (the subway system). I used to pride myself on knowing the subway system pre-baby, but now that I’ve memorized every stop with elevator access, I’d officially refer to myself as a MTA expert. God forbid I am rushing and select the route with subway stops nearest my destination (opposed to several stops away solely due to elevator access) and need to haul a stroller and baby up and down stair cases. The cost of childcare. Pre-baby, I had always heard how expensive childcare could be, but it wasn’t until I began to do my research that I saw this reality myself. Seriously, good, educational in a preferred area can run range from $3500-$6000 a month for a full week. Tiny apartments! We are fortunate that our apartment is considered larger for NYC, at just over 1200 SF. Yet there always feels to never be about space with all the little guys things and by that, I really mean toys. This is so difficult to answer since I am a major “foodie”and there are endless options in this awesome city. But since I am getting put on the spot, I would have to say, Spice and Treadwell Downtown. Spice: Their green curry basil fried, pad this and green curry are to die for. Oh and don’t forget the dessert. I love their ube cake and young coconut drink. My only complaint would be that I wish their was a closer location to where we live. Tread well Downtown: Some of my favorite dishes would be the fish and chip entree, which I love sharing my the little one. It as well comes with a side of fried, house greens, their house chipotle sauce and of course, malt house vinegar. My mouth is beginning to salivate as I am writing this post. If we stop by during brunch hours, my go to order consists of the salmon eggs benedict as well as an order of the berry french toast. Deliciousness. Without second thought, that answer would be my son, of course. The thought of possibly not wanting kids or that so distant day of “maybe” that I so often had, pre-child, still amazes me. He is the most precious surprise I have ever received and my heart is so fulfilled. NYC is filled with so many resources. One of the best cities in my boook. Great post. Thanks for sharing. Thank you for stopping by and reading. Yes, I agree. One of the additional reasons why I love NYC so much; all the resources.